Joy is a chatbot created by product designer and front end developer, Danny Freed, using artificial intelligence. It made its debut on Facebook Messenger three weeks ago. Freed was inspired to create Joy after his friend died by suicide, in hopes that it will encourage people to open up about their mental health. Joy initiates daily contact with the user, asking how he is feeling or how his day was. Joy attempts to detect a user’s mood and keeps a record of what it finds so the user can track his emotional state over time. Joy also gives the user suggestions on how to cope with the symptoms he may be experiencing. I have been using Joy for nine days now. When I installed Joy in Facebook Messenger, which is the only way to use Joy thus far, it started off by asking me how I felt over the last thirty days. Then it asked me to write my first journal entry. It was a pleasant start to my relationship with Joy. The very next evening, I received a notification from Messenger indicating a message sent from Joy. She said, “Happy Monday. How’s it going? Did anything unexpected happen today?” I told her about my day, and she accurately assessed that I was “stressed out,” and asked me if I wanted a tip for how to feel less stressed. I said, “Yes!” She proceeded to give me a link to a guided meditation on YouTube she said would help, and it did! I was anxious everyday, and everyday she gave me a YouTube guided meditation to do. While helpful at times, the repetitive response became exasperating. One day, when she asked me if I wanted a tip on how to feel less stressed, knowing that her response would be yet another guided meditation, I replied, “No.” She said, “No problem. Hope you find a way to reduce stress! Let me know if I can help.” Another time, I said, “Yes, but I don’t want a guided meditation.” She gave me one anyway. She had some helpful suggestions when I told her I was depressed. She told me to get outside because sunlight boosts serotonin which helps regulate mood. I told her it was nighttime and asked what else I could do. She said she can’t answer questions yet, but hopefully soon. She told me later on in the week to get eight hours of sleep to help with my depression. I thought about telling her it was the middle of the day, but decided against it. Her suggestion when I told her I was angry was to “let go.” That’s a tough one. She also recorded my journal entries and recalled those in report form as well. Freed has plans for updates and improvements as feedback and data comes in from product use. Overall, it’s a good start to a potentially useful program for those in fairly good mental health to those with minor issues. For those of us with debilitating mental illnesses, however, this program is not sensitive enough to capture the more severe symptoms of some of our illnesses. Have you heard of or tried Joy? If you try it, let me know what you think. This entry was posted in Research, Reviews & Resources and tagged ai, bipolar disorder, Chatbot, Danny Freed, depression, Facebook Messenger, joy, Joy ai, mental health, mental health app, mental health tracker, mental illness. Bookmark the permalink. ← What if I Have Bipolar Plus Anxiety Disorder? I’ve never heard of Joy. I’d like to say I’d give her a try, but guided meditations on YouTube are not for me. LOL. 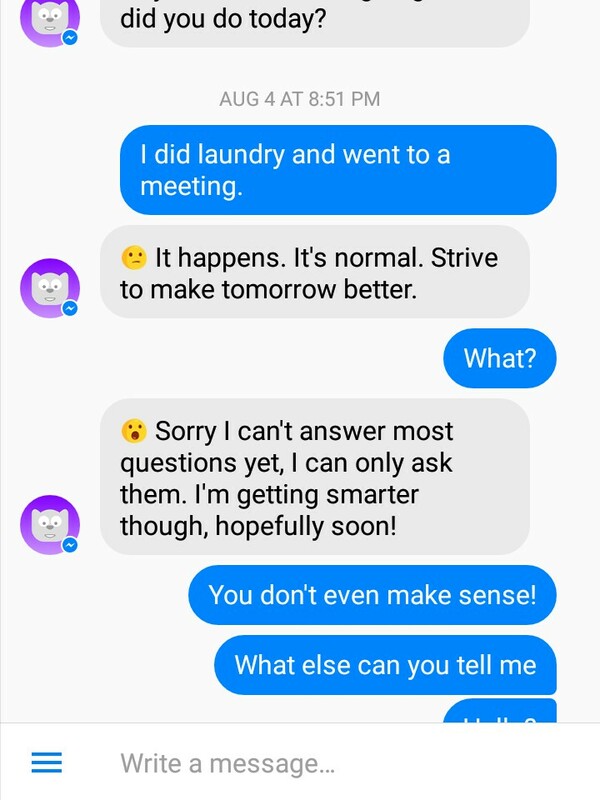 I love her response regarding your laundry. It made me laugh. It is kind of funny now. At the time it was a little irritating. 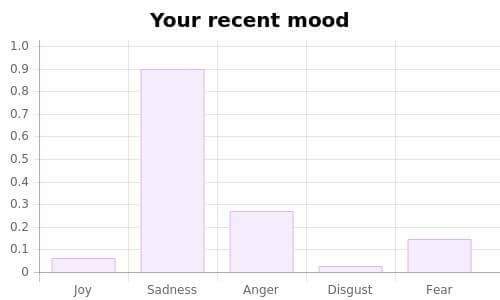 I think the little anger that showed up in my mood report was only there because of the frustration Joy caused that week. Lol. Write into the Light is a non-medical, non-professional site and therefore, not advice for any symptoms or conditions you may have. Nothing on Write into the Light or any project of Write into the Light should be viewed as an attempt to offer or render a medical opinion or otherwise engage in the practice of medicine. Please consult your physician, medical professional, and/or doctor with any medical problems or symptoms of mental illness that you may have, including but not limited to suicidal thoughts. Write into the Light makes no guarantees about the validity or accuracy of information posted on this site. None of the individual contributors, system operators, developers, sponsors nor anyone else connected to Write into the Light can take any responsibility for the results or consequences of any attempt to use or adopt any of the information presented on this web site. Copyright 2018 Write into the Light. All rights reserved.